It might not be a festive tale but Goodnight, Mister Tom, with its themes of redemption and acceptance, chimes with the spirit of Christmas. In East Riding Theatre’s new production, William Beech’s struggle towards a sense of belonging is movingly explored. This is partly down to the creativity of Jake Smith’s direction, which, with its swirling sense of action, captures the freedoms of childhood while veering away from mawkishness. 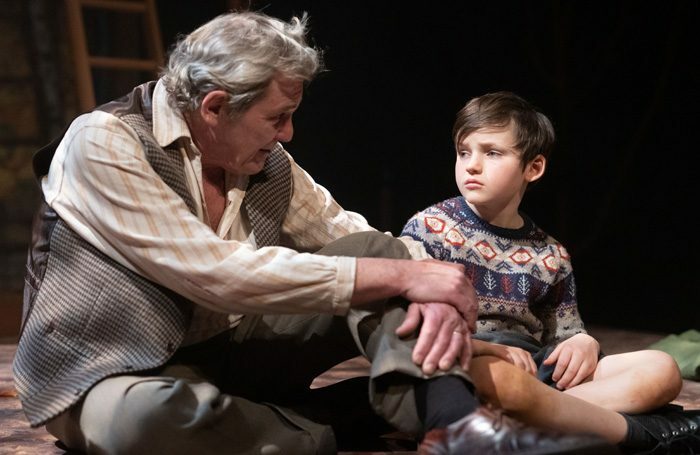 It’s also due to the performances, particularly Roger Alborough as Tom, whose gruff exterior is gradually peeled back, and the turns from Joe Dawson and Joel Walker, as, respectively, William and his fearless friend, Zach. These young cast members (who alternate the roles with Benjamin Ainsworth and Harrison McKenzie Donkin) convey the pleasures and the pains of youth, where high spirits are tempered with some harsher realities. In the later scenes , particularly, there’s a real sense of shellshock from the horrors William has experienced during his return to London. Ed Ullyart’s ingenious, two-tier, set mirrors the story perfectly. The lower level is of the simple interior of Tom’s rural home, while the upper, fronted with fencing, gives the sense of the wild countryside beyond. To convey London life, in contrast to this bucolic setting, black and white footage of rushing crowds are projected on to the backdrop. This gap between William’s two lives, shadowed with some moments of dread, is told unflinchingly, but with a real warmth.